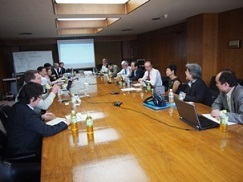 MGA Strategic Direction and Environmental Assessment (SD＆EA) Committee Meeting was held with Japan Council in Japan Society for the Promotion of Machine Industry on May 11th, 2012. Attendees were following: Okyay Kanyak (Vice Chair MGA Strategic Management and Analysis), Parviz Famouri (IEEE Region 2 Director), Donna Hudson (Past Chair - IEEE Technical Activities), John Reinert (Past Vice Chair MGA Strategic Management and Analysis) and 11 other members from IEEE Headquarters, and Hideki Imai (Chair), Hirohisa Gambe (Vice Chair), Yoshihiro Ariomoto (Secretary) and 7 other members from Tokyo Section / Japan Council. 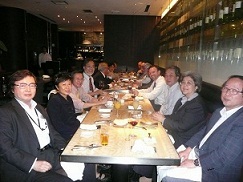 They discussed how to increase the number of the IEEE members in Japan, and how to make current members feel more satisfactory in IEEE membership. 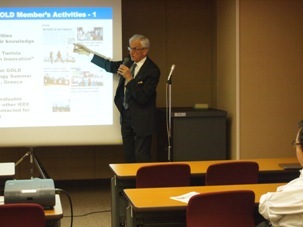 The 2012 Seventh Lecture of IEEE Tokyo Section was held in Japan Society for the Promotion of Machine Industry Hall with 16 participants on Monday, May 28th, at 2:00 p.m.
First lecturer Dr. Eiichi Ohno, IEEE Japan Council History Committee Chair, gave a talk entitled "Report on the IEEE Technical Tour Japan", which overviewed the IEEE Milestones and reported the Technical Tour held in May 20th-28th. Second lecturer Mr. Roland J. Saam, IEEE IEEE UK & RI Life Member Affinity Group Chair and IEEE Region 8 Newsletter Editor, gave a talk entitled "IEEE Technical Tour and Historical Activities in Region 8", which introduced the editing policy of the Newsletter of Regin 8 and its History activities involving other societies.